We now have the last of the gilt dial Calypsomatic and in my personal opinion they saved the best for last. I find that this reference is one of the most difficult to obtain as the production was likely very short. We are now looking at the late 1960’s with this production, likely around 68-69’ with ultimately the golden years coming to an end being the last of the gilt models. It is possible to have a gilt dial on the following 7986 model as another transitional but generally you will see they have mercedes hands as that was the standard hand for the 7986 with the non gilt dial. The 7985 has the closest feel to the legendary Rolex 6538/5510 big crown Submariner while still retaining its famous Calypsomatic charm. 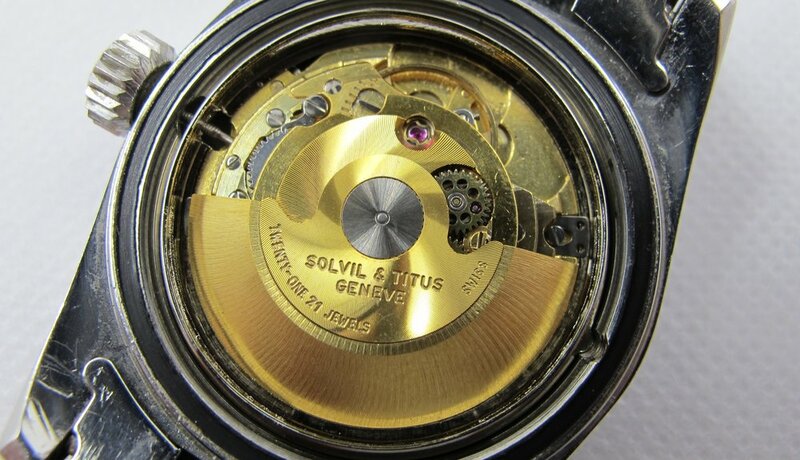 Beginning with the dial we have the same gilt glossy, small logo dial from the late 7085 and 7940. The hands should still be the pointed lollipop hand set. The date wheel is back to the blue and red with a white background. The original crystal should have a cyclops over the date but the size of the crystal is slightly different than the previous models. This crystal was introduced in this model and carried over to the 7986 reference. The 7985 reference introduced another mid-case for the Calypsomatic. This was a good compromise from the original case and the revised 7840 as the shape is right in between and we have back the beloved drilled lug-holes but this time the holes are slightly smaller. Long lugs help the watch wear much bigger than the list diameter. An obvious change is the new bezel with its new style font and thickness. The number 4 in "40" is still a flat top but the font is clearly different than the previous models. The black bezel now has a much thinner grip rim at the top edge with small grooves. The material is and feels more metal like than what we have seen on previous generations. It should not ratchet but should spin freely in both directions. 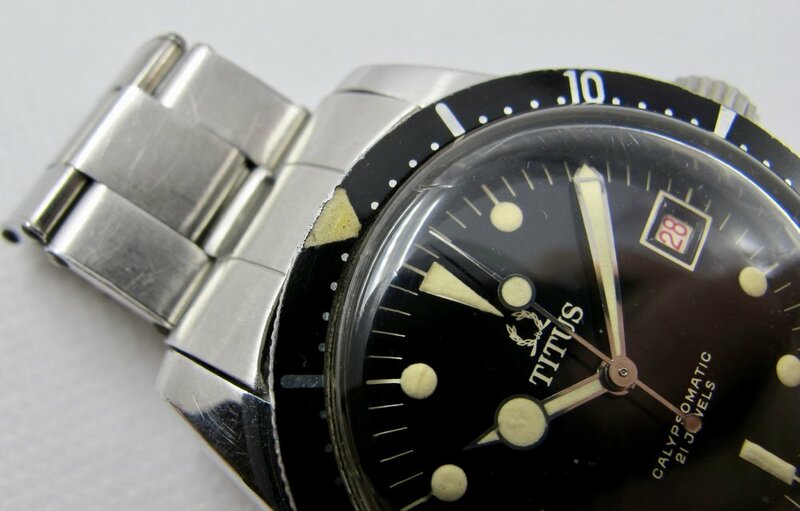 The bezel also has a triangle filled lume that is glazed over at the 60 marker. Expect the triangle to be slightly raised due to the seal. This was likely to improve the previous design where the luminous material degraded and often became completely missing. The crown for the 7985 is my favorite of any Calypsomatic and is exclusive for this reference. We have the introduction of what I like to call a true screw down with plenty of threads to feel the crown actually tighten down. The crown has large grooves and measures at a huge ~7.4mm. This crown is truly special as it is beautifully signed with a giant Laurel leaf logo with a center hole in the middle of the crown. This logo is larger than the leaf on the 7940 and the crown shape is much flatter with thick grooves that make it easy to grip. Similar design to the Rolex brevet big crown. Wears absolutely perfect on the wrist. The screw down case-back should be marked with the "7985" engraving below the logo and name. There will not be any markings in between the lugs on this reference. The bracelet is an oyster style rivet that tapers down significantly to a small clasp signed with the leaf and “Titus”. End-links are not stamped.